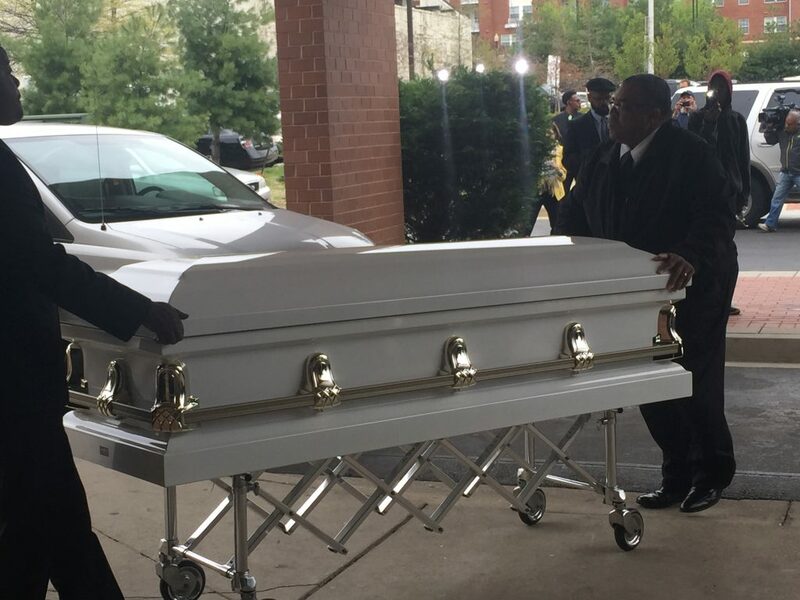 The casket of Freddie Gray arrives at the church and is transported to the hall. Powerful symbolism cloaked the day Freddie Gray was laid to his final resting place. Gray skies overlooked the ornate, gray casket that was transported toNew Shiloh Baptist Church, located on the Westside of Baltimore. Press from all parts of the globe crowded in – cameras taping and clicking furiously as the casket was removed from the hearse and transported inside the church. Over 1,000 people walked blocks, traveled miles, and waited hours outside for the church doors to open so they could enter and pay their respects. 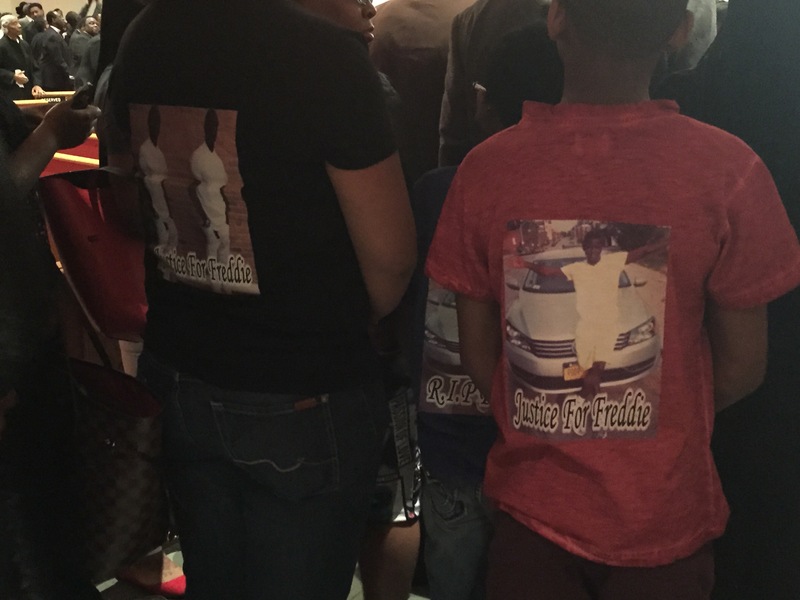 Many people attended not because they knew Freddie Gray, but because they know too many Freddie Grays. The world did not know the 25-year-old resident of Gilmor homes in Baltimore’s Sandtown neighborhood in life, but it knows him in death. After his funeral, the molten lava of rage and fear towards law enforcement that has long simmered beneath the surface finally erupted. In order to understand the broader context of the city’s present turmoil, let’s establish that Gray’s untimely death is not an isolated incident. His name is only the newest name to join a long list of those who have unjustly died at the hands of law enforcement officers sworn to protect and serve. In Maryland, that number has surpassed 100 in the past four years. Days after Gray’s death, Baltimore City police have still been unable to provide the family with a reason for why he was chased by police, arrested, and tossed into the back of a paddy wagon. His spine was almost severed during the process, but no one seems to know the circumstances of how that happened, either. He suffered intense pain, begged for an inhaler and medical attention. Rev. Jesse Jackson Jr. 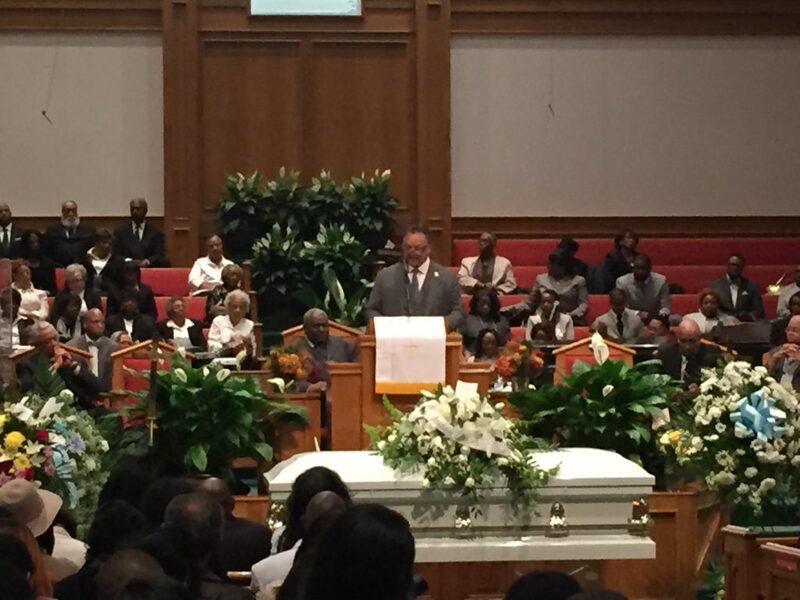 Speaks at Funeral service for Freddie Gray at New Shiloh Baptist Church. Media coverage is fixated on the protests and plundering in Baltimore. Maryland Governor Larry Hogan has announced a state of emergency and deployed the National Guard. Baltimore Mayor, Stephanie Rawlings-Blake, imposed a week-long 10pm curfew on the city. These same authorities, who are now pleading for peace and calm, still have not explained the crime for which Gray paid with his life. We get it. The civil rights movement of the 1960’s taught us the value of non-violent resistance and civil disobedience in bringing about lasting reform. But when the 2015 session of the Maryland General Assembly ignores the efforts of a broad-based coalition and fails to adopt any meaningful legislation that would bring police accountability and reform, it becomes easier to understand the protestors’ frustrations. When yet another mother sobs uncontrollably as she lays eyes on her deceased son for a final time, and prepares to bury him without knowing or understanding why he was killed, the community’s palpable anger becomes more justified. When Maryland maintains some of the nation’s most lenient laws that shield law enforcement officers from disciplinary action despite documented evidence of abuse of power, the hopelessness becomes more relatable. None of this is to excuse the lawlessness, plundering, and destruction of property; it simply places the current crisis in context and helps us understand the true nature of its scope. Freddie Gray’s family members file into the church during yesterday’s service. Racial tensions are not new to Baltimore. A prison industrial complex that capitalizes on socio-economical strife, systemic racism and racial injustices, and a long-standing history of gang violence and drug-related crimes,–all of these factors have contributed towards the molding of a society that is designed to undermine and fail its people. In the unrest gripping the city, our nation is witnessing the symptom of a much larger problem that’s not limited to Baltimore, but spreads to towns across the nation. Baltimore boasts a black mayor and chief of police, but it needs more than tokenism in high-level positions. It needs legislation that upholds the rights of citizens and treats them equally and justly regardless of race or socioeconomic status. It needs corporations to invest in the Westside as much as they do in the Inner Harbor and Harbor East. It needs elected officials who prioritize the concerns of their constituents and work for them – not against them. Baltimore needs educational resources for families to stimulate and nurture the next generation’s imaginations, minds and hearts. It needs opportunities for young Black men to attain an education, seek gainful employment, and earn a respectable income so they can support a family. It needs trust, faith, love, hope, patience and healing. We can shout from the rooftops calling for constructive dialogue and an end to violence. But if there’s one lesson to be learned from Freddie Gray’s death, it’s this: If we truly want peace, we must first work for justice. 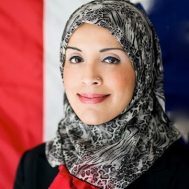 Zainab Chaudry is a grassroots activist in her home state of Maryland.